On December 1, LIVESTRONG.COM kicks off its 30-Day Meditation Challenge along with The Mentors Channel and The Hall Center. Cleaning isn't just for your closet. By meditating daily, you can clear your mind of unwanted clutter and start to live more intentionally. 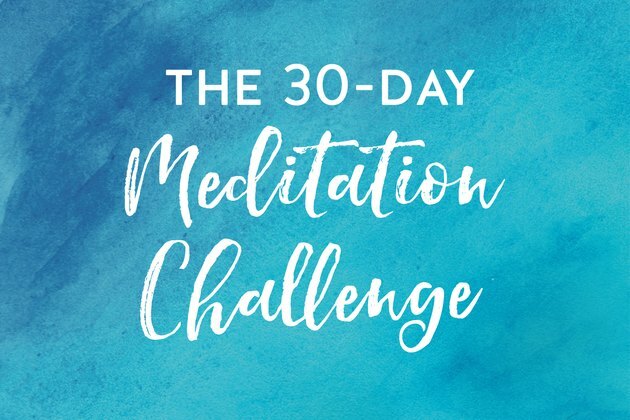 So we challenge you to spend 30 days incorporating five to 15 minutes of meditation into each day. Here's how the challenge works: For the first 10 days, spend five minutes meditating (see below for what that can look like). Then for days 11 through 20, add five minutes and meditate for a total of 10 minutes. And for the last 10 days of the challenge, spend 15 minutes a day in mindful meditation. Need some inspiration? Check out this 10-minute guided meditation with The Mentors Channel's Veronica Krestow. You can come back to this meditation every day of the challenge or when you need a little guidance. The great part is that there's really no right or wrong way to meditate. You can sit quietly by yourself in lotus pose or you can take a walk around your neighborhood and mindfully take in your surroundings. Get a printable version of the calendar so you can mark off each day that you meditate. One of the most often-cited benefits of meditation is that it reduces stress and cortisol levels in the body. And who doesn't want that? By sitting quietly for several minutes, you encourage your brain to slow down and your body to be still and recover. 2. Meditation improves your health. Several studies have shown that regular meditation (even as little as five minutes a day) helps your immune system function better and can even reduce pain in some cases. 3. Mediation boosts your productivity. Yes, doing nothing can actually help you during the times when you are doing something. Meditation improves your focus, attention and memory as well as your ability to think creatively. One study even found that you could increase your attention span in as little as four days of meditation training. 4. Meditation makes you happier. You'll boost positive emotions while decreasing depression and anxiety. Meditation can also make you more compassionate and less lonely. What Do I Do While I Meditate? That's the point of meditation. You don't have to do anything. You can, of course (see items 2 to 4 below), but it's perfectly acceptable to just sit and do and think and be... nothing. It's perfectly normal to start all zen-ed out and then have stray thoughts come flying into your brain. Just acknowledge them and allow yourself to let them go. 2. Repeat a mantra or use mala beads. Oftentimes, repeating a word or phrase can help your mind stay focused during meditation. The most common mantra is "om," but you can say, chant or sing anything in any language that helps you find your center, either out loud or silently. Some examples: "Today, I choose to be gracious," "My breath is deep and my heart is open," "I am strong and capable," or any name for god in any religion/language (Allah, Govinda, Yaweh, etc.). 3. Pray or take time to be grateful. You don't need to be religious or even super-spiritual to enjoy meditation, but a lot of people use this time as part of their spiritual practice. If you pray or want to think of specific scriptures, you can. If you don't hold any particular religious beliefs, try just being grateful for the things and abilities you have. 4. Listen to a guided meditation. Meditation can be awkward for beginners if you're not sure what you're supposed to be doing (but again, you're not supposed to be doing any one particular thing). So guided meditations can be a helpful way to get started. You can find them through UCLA's Mindful Awareness Resource Center, Deepak Chopra's website, on YouTube or in an app like Stop, Breathe and Think. Will you join the challenge? What are you hoping to gain from it? 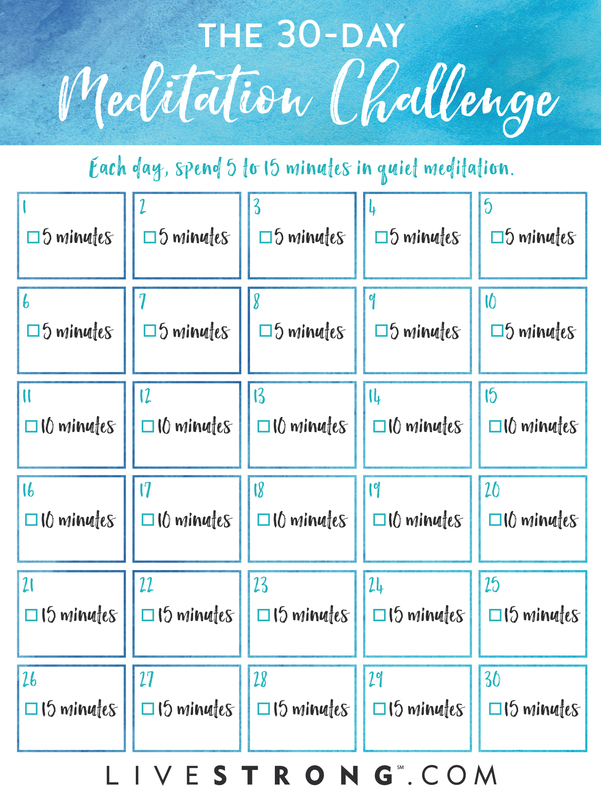 Have you ever participated in a meditation challenge before? What did you learn from it? Share your meditation stories and tips in the comments below! Is the Wellness Industry Taking Advantage of You?